A crane machine that features the new free credit give-away along with the highly successful instant replay feature. The software capabilities offers the operator guaranteed, audited statistics. The X-Factor has infra-red, hand-held game programmers. The machine looks good with its display shelving, showroom lighting and gas-strut doors, offering greater display of the products and ease of operation. 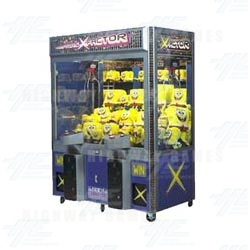 A crane machine that features the new free credit give-away along with the highly successful instant replay feature. The software capabilities offers the operator guaranteed, audited statistics. The X-Factor has infra-red, hand-held game programmers. The machine looks good with its display shelving, showroom lighting and gas-strut doors, offering greater display of the products and ease of operation.